Summer is a great time of year. A time to be with our families and friends. There are a lot of us that will be traveling to be with those we love. Traveling with young children can be hard but there are a few things we can do to make the trip a little easier. There is nothing worse than trying to rush with children in tow. If you are flying, arrive early. Give your family time to check in, take your time to get to the gate and relax while you are waiting to bored the flight. This can be a really fun time to teach your children and point out new and exciting things. If you are traveling by car expect extra bathroom stops and plan accordingly. The first road trip we took with young children we treated like the road trips we used to take without kids. No stops, just our destination. We learned quick. Expecting kids to sit for 8 hours and never move will make the trip miserable for everyone. Plan a stop or two for the kids to stretch their legs. Grab a popsicle when you get gas, or stop for an ice cream cone. The 10 minute break will really help. It is tempting to dress your kids in your favorite outfit so that when you arrive they are dressed "just so". This will just make your kids uncomfortable during travel, and if you are like me, you will be uptight trying to keep the clothes clean. Dress your kids in comfortable clothes and in layers. If you want to change them when you get close to your destination, plan for that. You will find that everyone travels better when you don't have to worry so much about spills and wrinkles. The layers will allow your children to be comfortable on the planes when they are cold, and they can take things off when they are not needed. Extra clothes also make good pillows and blankets. I always get a few new toys or activities for the kids when we travel. They are small things like a new set of crayons and a new coloring or activity book. The dollar store is perfect for picking up inexpensive and fun little treats. I also like to bring things that zip, button and snap. They keep little hands busy. Before we leave I like to wrap them up like little presents. The kids think it is so fun to open them and the opening itself takes time. I do the same with the special treats. Their favorite candy or cookie gets wrapped up. Asking your children to travel without their favorite toy, blanket, or stuffed animal can really make the trip miserable. If there is something that your child can't live without, be sure you bring it with you. That said, there is always the possibility of it getting lost or left behind. Which can bring even more trauma. Be sure you check and double check so nothing is lost. If your little one uses a pacifier, be sure you bring more than one. Even more than two. Bring a couple of their favorites and something to keep the pacifier attached to them. The last thing you want is to try and find a pacifier rolling around under plane seats, or under car seats. I also use pacifier clips to keep favorite toys off the plane floor. ...Stroller that is. Asking tired little legs to keep up in airports is asking a lot. Especially if you are trying to catch connecting flights and are forced to rush. It is worth it to carry-on a very small umbrella stroller to put your toddler in as you are changing planes, walking through the airport, waiting for your rental car/ride, or walking to the parking lot. You can buy them for less that 10 dollars and they are very light weight and compact. Plus, it makes a great place for them to sit while you are waiting and you can hook a bag or two on the handles as you walk. On top of that, having one on your trip is always nice. Bring some music for your little ones. It can help sooth them and distract them. It can also help them calm down enough to fall asleep. Make sure you bring enough headphones for everyone to listen. You can get headphone splitters for less than 5 dollars. The splitter will let you plug more than one head phone into one jack. Music in the car is wonderful also. Songs that they sing along to, or do actions to will help distract them as you travel. If you are traveling with more than one child, pack their toys, blankets and special things in separate bags. If they are old enough, let them help you pack the bags. They will pack the things they want to play with so you will know they will be happy. Keep the bags light so they can carry them and by separating things it will make everything easier to keep track of and find when you need them. It doesn't hurt to check in with your doctor before you leave. Ask what to do with motion sickness, car sickness etc. They can tell you what to give your kids and how to help them if they do get sick while you are traveling. Be sure you have a few medications packed for easy access. Just in case. You don't want them to be under the plane, or in the trunk when you need them. If you are traveling by plane, call and ask a few questions. They can tell you the guidelines for liquids, bottles, toiletries etc... The worst time to find out the rules is while you are holding your two year, in line, with no shoes on, watching them search through your bags. Especially during high travel time. Be sure you pack your sense of humor. Despite your diligent planning things might not go perfect. Travel usually means kids are missing naps and their routines are interrupted. Role with it. Laugh and be patient. When we stay patient and keep our heads clear, we are better able to solve the problems that will come and creatively deal with the meltdowns and delays. This will obviously be different depending on where you are traveling, but it is a good place to start. Include an outfit for each day of the week, plus an extra shirt or two in case of spills. Have your kids wear bright colors on travel days so they are easy to spot in the crowd. Be sure you keep your toiletries in plastic bags. Not only for plane travel, but things open up in cars also. Even solid deodorants. Not that I would know from personal experience or anything. Blow dryer, brushes, combs and hair "stuff"
Paperwork: ID, driver's license, insurance card, shot records for children under two, copies of birth certificates and marriage certificates if you are going out of the country, passports, copies of your travel plans and confirmation numbers. Large and small plastic bags (these can be used for everything from wet clothes to trash to toys and snacks. Do you have any tips for traveling with small children? Stickers are what get us through plane trips. I take plain paper, fold it in half, staple the crease and now I have a sticker book. I think buy $20 worth of stickers (it may seem like a lot, but my sanity is worth $20) and my 3 year old is good for 2 hours on the plane. The smaller the stickers the harder for her to peel them and the longer she is entertained. She does not have stickers at any other time than when we are on a plane, so she loves it when we travel. I am visiting from SITS, I love your blog... I am your newest follower! I love the post too. Traveling with kids, little kids can be hard. You do have to be prepared. I've flown several times with one or both of my kids and because of schedules it's always been ME alone flying with children. First it was a 6 leg trip when my son was 4.5 months. Then Boston to Orlando with a layover with my 18 month old. And the most recent was Boston to Phoenix with an almost 3yr old and 4 month old. 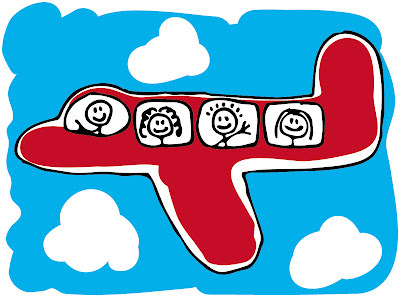 It is totally doable but I did discover three tips for flying with little kids. 1. Leash, whether it's one of those backpack things or a wrist to wrist one, this is great because it allows them a little room to move without you having to constantly move all the stuff you're carrying. This is especially essential if you have layovers. 2. Car seats! It is a nightmare to carry them I admit but man they are so used to sitting in them that even when my son was almost 3 being in his car seat for almost the whole trip from MA to AZ was no biggie. That along with new toys and tip 3 kept him entertained the whole trip. 3. This last tip is for bigger kids only... LOLLIPOPS! I bought a bag of them and gave them as many as he wanted while he played, I think he had about 20 during the 6+ hr trip. He is normally not allowed any so it was a huge treat. But he got to pick the flavor and he is quiet while eating them. Every time I have flown I see the eyes of my fellow passengers when we got on, sweaty mom, loud excited kids, uh oh here we go, trip from hell! And EVERY time I have been complimented on my children's behavior!!!! Yay! Thanks for the tips Heather, our Thanksgiving roadtrip with our 1 year old went off without a hitch!